t*rexes and tiaras: La vie en rose.. So, it feels like an absolute age since I last wrote anything here as I've been gallivanting about in the depths of France, but it's back to reality today with heaps to catch up on. And so many photos to look through, presents to open, and thank you cards to write. Anyhow, Saturday morning saw us exploring Paris, starting out with a visit to Shakespeare and Co, and then a little wander over to Notre Dame, through this little park with these beautiful rose arches in them. Obviously, I had to take the opportunity to wear some of my Paris-themed dresses whilst in Paris. Not that I'm at all obsessed..or a total geek. (Oh, wait.) This is one which I made quite recently. I bought the fabric from Guthrie & Ghani back in February, and I knew I wanted to make it into a dress to take with me, so of course I left it right until the last minute. For sooo much walking around the city of love, I opted for these New Look sandals, which I still adore. That little bit sturdier than jelly shoes, with their proper soles, they're so comfortable for wandering around - I can wear them all day without any tired feet, which is nice, and something I don't find from flatter things like Converse. I couldn't pass up the opportunity to geek out just a little more and use my Yoshi Paris bag for my weekend in Paris either. Despite being pretty tiny as handbags go, it had plenty of room for my camera, purse, phone and passport, which is about all I tend to carry about with me when I'm away. 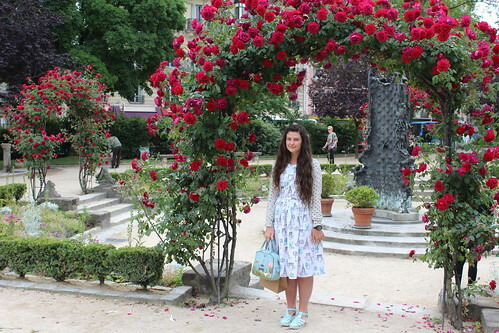 If you can't wear an Eiffel Tower dress in Paris, where can you? Seeing all of your Instagram posts was lovely!